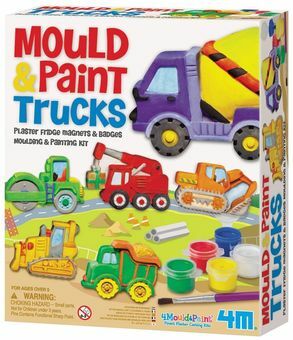 Create your own trucks magnets or pins by using the mould, plaster, paints and brush included in the kit. Contains 1 mould with 6 designs, 1 paint strip, 6 magnets, 2 pins, 1 paint brush, 2 bags of fine quality plaster and detailed instructions. Content sufficient for making 6 magnets or pins.